This must be some kind of landmark in the history of Swedish online media. 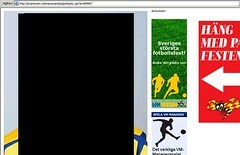 Expressen speculates in which Swedish player that leaked information about the locker room quarrel after the World Cup game against Trinidad & Tobago and posts a photo that is, well, 90% black. If they only could do the same with the texts, I might even start buying Expressen. Footnote: The black square hasn’t stopped readers from trying to figure out who’s on the photo. The blog Bara Ben På Glenn Hysén (Bare legs on Glenn Hysén) points to Anders Svensson. Tags: World Cup, media, media, fotboll, vm.